Game designers make the games they want to play. We’re selfish like that. But it’s a good thing, because it means we want our games to work (selfish) and we love what we make. I walked up just as they drew and cheered, so I asked them to strike a victory pose so I could capture the moment. 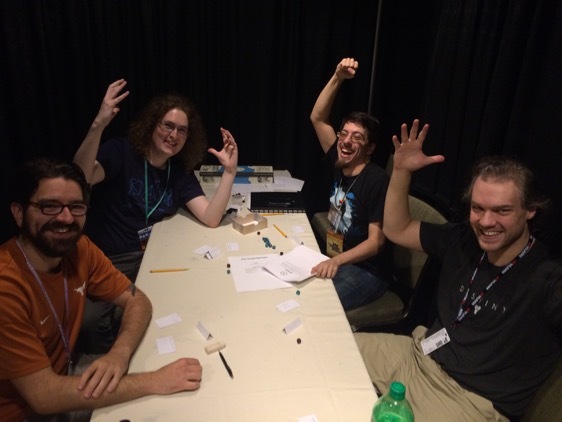 I have no idea what was going on in this game except that it was Follow, the last game slot of PAX, and they had won their last challenge. And I know that face. But you know what’s really interesting? The face when you draw and lose often looks exactly the same, but maybe with more screaming before the smiles. Because good story is good story.